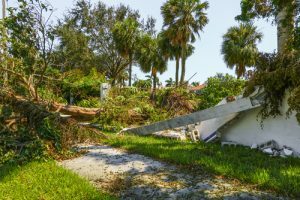 Hurricane Damage in Florida ….. Am I covered? Wind damage and wind driven rain damage will be covered by hurricane insurance. However, if your home floods due to the hurricane, then this may not be covered by hurricane insurance. You will need to have flood insurance. If you do not have flood insurance, then you should ask your hurricane insurance policy provider if they would cover part of the damages. Every insurance policy is different, so the coverage that you get can vary. While a homeowners insurance policy may not cover hurricane damage, there are some damages that still may be covered. If there is structural damage done to your home, then it will likely be covered by your homeowner’s insurance policy. That is why you should check with your homeowner’s insurance provider if your home has suffered structural damage. You will need to report your claim to the insurance provider as soon as possible. Claims are typically handled on a first-come, first-serve basis. Write down the claim number after you have filed. You should also keep track of any expenses that you incurred as the result of the hurricane such as evacuation costs, hotel and meals.